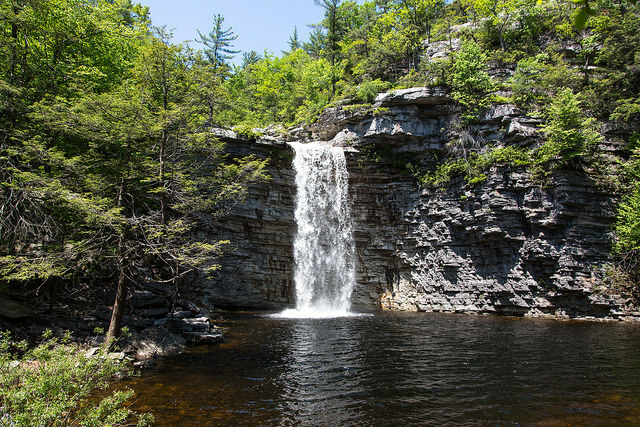 Minnewaska State Park Preserve (mentioned later on in the article) makes for a rejuvenating hike if you follow this scenic waterfall trail. You can also find a moment of tranquility amid an extensive chestnut forest. Courtesy of Sébastien Barré via Flickr. All Families Weekend is quickly approaching. Wondering where to go with your relatives and friends? Looking for new spots near campus? This guide offers something for everyone. Dia:Beacon is an art gallery nestled on the banks of the Hudson River in Beacon, NY. Only a 30-minute drive from Vassar, Dia:Beacon is an inspiring place to spend an afternoon. The gallery features art from the 1960s to the present, including works by Andy Warhol, Dan Flavin and Richard Serra, to name a few. Dia:Beacon is unique not only because of its art collection, but also its setting: The gallery is situated in Nabisco’s former carton and printing plant. Courtesy of Ron Gogswel via Flickr. 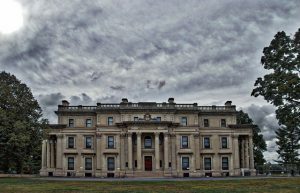 Pictured on the left is the stately Vanderbilt Mansion main entrance, an example of the Beaux-Arts architectural style. On the right is an Italianate villa, home to the father of telegraphs and Morse Code. Courtesy of Wikimedia Commons. 119 Vanderbilt Park Road, Hyde Park, NY Built in 1896, the Vanderbilt Mansion is one of the oldest estates in the Hudson Valley. 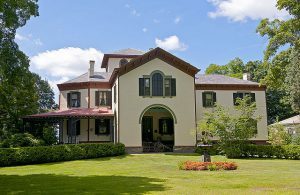 The 54-room mansion overlooking the Hudson River was originally home to Director of the New York Central Railroad Frederick Vanderbilt and his wife, Louise. Hyde Park was attractive to the Vanderbilt family because Manhattan was easily accessible via the New York Central Railroad, which they owned. The estate, set on 600 acres, features an Italian-style garden and numerous auxiliary buildings in addition to the mansion. Only a 25-minute drive from campus, this national landmark is open to the public seven days a week for $10 per person, with guided tours offered throughout the day. Located on a bluff overlooking the Hudson River, the Samuel F. B. Morse House was home to Morse, the inventor of the telegraph, since 1851. The Italianate Villa treasures a collection of Hudson River School paintings, antiques and 19th-century American furniture. Locust Grove is a short 10-minute drive from Vassar. The home and gardens are open daily, with guided tours offered. A 30-minute drive from Vassar, Millbrook Vineyards and Winery is one of the top wineries in not only the Hudson Valley, but also in New York State. Millbrook is famous for its critically acclaimed selection of wines. Labeled “the Hudson Valley’s flagship winery” by The New York Times (millbrookwine.com, 2018), the 130-acre vineyard is open daily from noon to 5 p.m. for wine tastings and guided tours. The Culinary Institute of America (CIA), one of the most renowned culinary schools in the United States, offers five eateries just 20 minutes from campus. The Apple Pie Bakery Cafe provides casual dining, serving delicious soups, salads and sandwiches, as well as homemade desserts. The American Bounty Restaurant brings all the best of the Hudson Valley to the table. Offering Hudson Valley wines as well as the best of the seasonal harvest in every meal, American Bounty fuses traditional and contemporary regional dishes to create a luxurious dining experience. Ristorante Caterina de’Medici & Al Forno Trattoria offer upscale and traditional Italian fine dining overlooking the Hudson River and the CIA’s herb and rose garden. The Bocuse Restaurant, named after famed French chef Paul Bocuse, offers traditional French cuisine and a sophisticated dining experience. The Post Road Brew House presents a unique selection of the CIA’s own craft beers in a relaxed setting. Enjoy light appetizers and mouthwatering entrees while sipping the CIA’s finest brews. 5281 Route 44-55, Kerhonkson, NY Minnewaska State Park Preserve is comprised of 22,275 acres of land and is an idyllic place for a hike or a picnic. The park is known for its scenic views of the neighboring Catskill Mountains. Featuring both carriage roads and narrower hiking trails, Minnewaska is suitable for hikers of all levels. The preserve also contains three lakes, one of which is the well-known Lake Minnewaska, as well as various waterfalls. Just a 50-minute drive from Vassar, Minnewaska is a picturesque setting in which to view the Valley’s renowned fall foliage. An hour-long drive from campus, Woodbury Common Premium Outlets is the ideal choice if you’re looking to go shopping and treat yourself. With over 200 outlets, Woodbury Common offers high-end designer brands as well as more affordable options. The outlet features labels such as Timberland, J. Crew and PacSun.